Get the score for free! Victoria’s Office of the Dead includes his second Requiem Mass, written for six-part choir. This music, often known simply as Victoria’s Requiem, has been regarded as some of his finest and one of the last great works in what we call the Renaissance polyphonic style. Its refined and dignified austerity is shot through with passionate conviction; it glows with extraordinary fervor within a musical and spiritual atmosphere of serenity and fitness for its liturgical purpose. But it does need some explaining. In the last years of the twenty or so that he spent in Rome, the Spanish priest from Avila, Tomás Luis de Victoria, composed and published in 1583 a book of Masses including a Missa pro defunctis for four-part choir. This early Requiem was reprinted in 1592. By then Victoria was well established in Madrid as choirmaster and chaplain to the Dowager Empress Maria, Philip II’s sister and widow of Maximilian II, now in retirement at the Royal Convent of the Barefoot Nuns of St. Clare. The Princess Margaret, Maria’s daughter, was professed with solemn vows in 1584 and she was one of the thirty-three cloistered nuns whose daily services, the liturgy of Divine Office, were rendered musically by twelve singing priests and four boys (increased to six after 1600). In 1603 the Empress died on February 26 and was buried in the convent cloister three days later. The services were probably simple. The great obsequies were performed on April 22 and 23. These took place at the Church of St. Peter and St. Paul (where Madrid Cathedral now stands). The Convent Chapel was much too small for such memorial service. Vespers of the Office of the Dead was sung; then, in the early hours, Matins of the Dead, which we used to call the Dirge (from the Latin “Dirige, Domine…” with which the First Nocturn begins). Then, after chanting of Lauds, the Missa pro defunctis, the Solemn High Mass of the Dead, was celebrated. The catafalque representing the Empress Maria in her coffin stood between the coro and the high altar. King Philip III was there in his mourning black and silver, his cousin Princess Margaret, the royal nun, all the dignitaries of church and state, crowded into a scene which may now make us think of an El Greco painting, all to witness that ancient Catholic way of death, the Requiem Mass. For this occasion the composer Victoria wrote his second Requiem or, correctly, as he called it, the Office of the Dead. He wrote music for the Mass itself, a funeral motet additional to the strict liturgy, and one of the great Latin texts for the ceremony of Absolution which follows the Mass, and a Lesson that belongs to Matins. 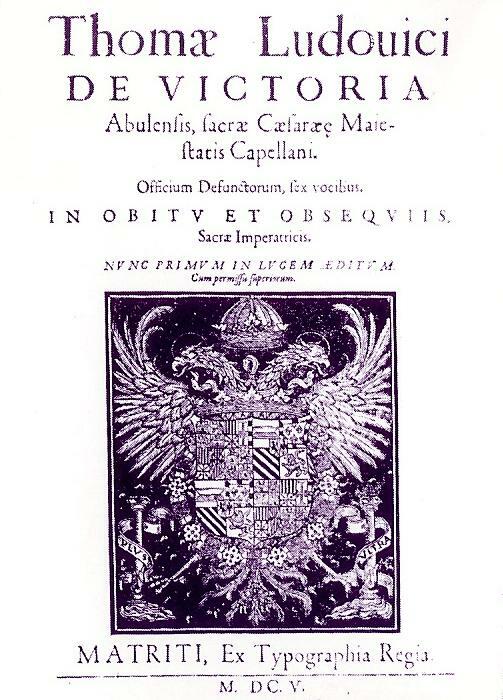 Two years late, Victoria published this music [Royal Press, Madrid, 1605] and it has become revered as well as admired, for it seems to be somehow a Requiem for an age – the end of Spain’s golden century, the end of Renaissance music, the last work, indeed, of Victoria himself. At least, he published no more. It has been said that it was Victoria’s Swan Song, but in his dedication to Princess Margaret it is clear that Cygneam Cantinem refers to the Empress. Victoria could hardly have known in 1603 or 1605 that he was to die in 1611 aged sixty-three. The dedication at the front of the 1605 print clearly states that he, Victoria, composed this music for “the obsequies of your most revered mother”. The Mass music, provided by Victoria with the proper plainsong intonations and verses in the manner of his time, is written for six-part choir with divided trebles, alto, divided tenors and bass. The plainsong melodies are taken over into the polyphonic fabric in the second treble (except in the Offertory when the chant is in the alto). The first treble soars above and bellow the slow unfolding of the paraphrased plainsong, giving the whole texture a wonderful luminosity. The use of two tenor parts contributes to the lightness and clarity. Even the plainsong intonations and verses are clearly specified to be sung by the boy trebles. The six-voiced grandeur of sonority as Victoria builds his short Kyrie eleison is followed by the Christe with just the four upper voices in a passage so sad that it seems like ritualized weeping in music. Having ended the Mass, Victoria continues with the motet Versa est in luctum and we assume it to have been sung as the clergy and the dignitaries assembled round the catafalque (representing the Empress). The responses, the music he wrote for the solemn occasion. The Victoria’s Officium Defunctorum is the repertoire chosen for the Rimini International Choral Workshop with me, Peter Phillips and Ghislain Morgan, 31 August – 6 September 2014!